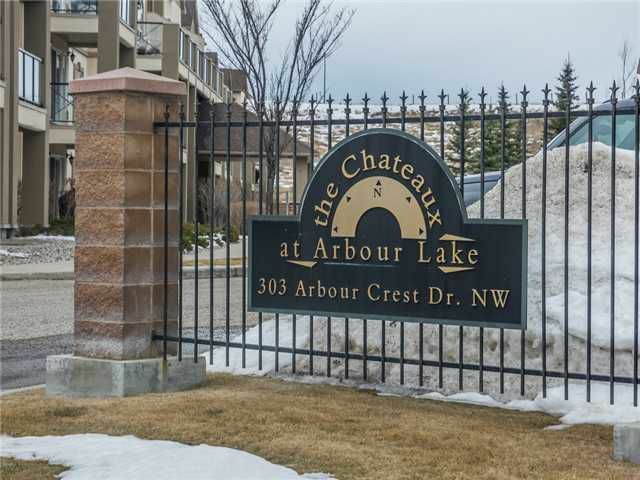 Beautiful 2 Bed/2 Full Bath condo in Chateaux Arbour Lake (+18 complex). This immaculate unit is located on the 2nd floor and boasts over 1229 sq.ft. + oversized WEST balcony. The unit features an open concept living room, formal dining room & kitchen. The living room has a cozy gas fireplace & sliding doors to private balcony. If you love to cook, this unit features a spectacular kitchen with a huge island, breakfast bar, tons of counter space, corner pantry, oak cabinets & white appliances. The Master suite boasts a walk-through closet, large windows & private 4-pc en-suite with tub. Comes complete with in-suite laundry & storage, custom window coverings, indoor heated parking. Secure building stacked with amenities: GYM, SAUNA, BILLARDS/POOL TABLES, SOCIAL ROOMS with BIG TV's, ELEVATORS, CAR WASH BAY & STORAGE LOCKERS. Outdoors enjoy a courtyard with fountain, pond & gazebo & community access to Arbour Lake. Low Condo Fees include all amenities. Bus stop to LRT at complex entrance.